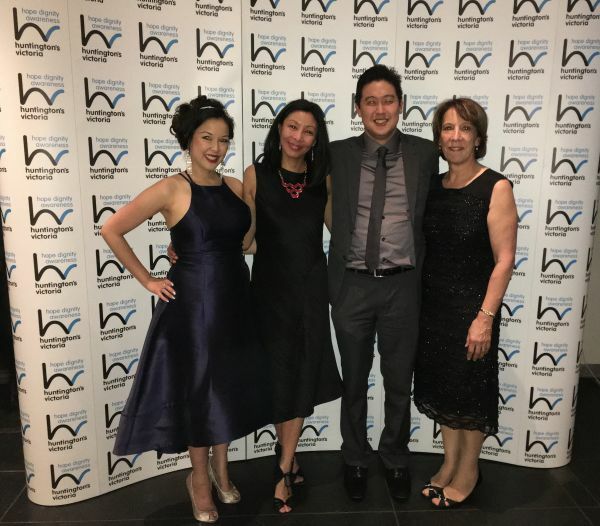 The AUPOA Huntington's disease (HD) research team attended this year's Huntington's Victoria Charity Gala ball, held in Melbourne on 15 October 2016. The AUPOA HD research team (from left): Dr Anita Goh, Dr Samantha Loi, Dr Terry Chong and Joy Preston. Huntington's Victoria is a state-wide organisation dedicated to supporting and assisting people affected by HD. The Huntington's Victoria annual Gala ball aims to bring the Huntington's community together with it's supporters to build the profile of Huntington's Victoria and raise essential funds to ensure the continued delivery of quality services to the wider HD community. For more information on HD research at the AUPOA, please call us on (03) 8387 2483.